The Eurasian jay is a common bird, and it is famous for its ability to imitate different sounds. The importance of this species in forestry relies in the fact that the Eurasian jay collects and hides oak acorn under in the litter layer forming a winter food reserve. At the same the uneaten oak acorns contribute to the recruitment potential of oak forests. Oak acorns are often transported for long distances (kilometers), thus recruitment can occur far from the seeding trees. Thus, Eurasian jay has an important role in the forestation of abandonment areas and in the natural transformation of forest with alien species (pine trees, acacia, etc.) to semi-natural forests. 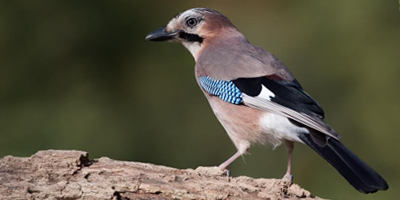 However, it has to be noted that the Eurasian jay consume a large amount of animal resources, and its robs the nests of other birds, thus its role is controversial in terms of nature conservation and wildlife management. This is species is unprotected and quite frequent species, but due to its ecological role and in its role in forest “plantations” it is important to maintain its habitats and food resources. By increasing the deadwood ratio in the forest, we promote the presence of insects, thus we enrich the food resources of this species. Creating favorable habitats for this species also contributes to the natural renewal of oak forests.